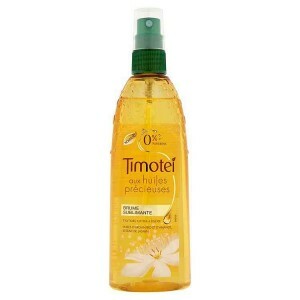 Timotei Precious Oils Mist works for hair that is extremely dry, damaged and often undergoes heat styling, colouring. It will also nourish dry and normal scalp. If this is your hair and scalp type, this product is right for you. You must try it out. When to use Timotei Precious Oils? If you often change your hair colour, use a blow-dryer or flat iron, feel free to nourish your hair with Timotei Precious Oils. It will be most useful if your strands are dry, weak, damaged whereas hair ends – split. What is more, you can use it to tame frizzy and static hair. Apply it before and after heat styling. What are the properties of Timotei Precious Oils? Timotei Precious Oils fights frizz and static, makes hair smooth. Thanks to the product, you will easily tame even most unruly fly-aways and style any hairdo. Mist formula brings shine and moisture. The product has a delicate consistency. It neither weighs hair down nor makes strands greasy. Additionally, Timotei Precious Oils protects during heat styling. High temperature will no longer damage your hair. Your hair ends won’t be split. How to use Timotei Precious Oils? You can use a few different ways. Spray the cosmetic onto blow-dried hair to make it shiny and silky smooth. You can also use the product if you want to make detangling easier and less time-consuming. Apply it prior to heat styling as well to protect strands from damage and dryness. Hold the nozzle 8 inches from hair; wait until it gets absorbed.